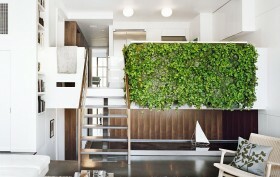 The green wall at the 7th Street Residence designed by Pulltab Design puts our few measly house plants to shame. The custom-made garden wall was installed as part of an apartment renovation to be a focal point of the home, as well as to give the contemporary space a mysterious quality. A shallow reflecting pool sits under the vertically planted wall and serves as a landing pad for water droplets that fall from the wall’s concealed irrigation system. Additionally, the pool, fabricated from folded steel sheets and complete with swimming goldfish, adds a calming water element to the living room.